With an anvil and a hammer a blacksmith can make everything else he needs. Then he makes everything everyone else needs: the farmers, builders, carpenters, craftsmen, householders, cooks. Tools for Self Reliance: Practical Help to Practical People Overseas -- "In the struggle to develop, bare hands are not enough -- Could you work without tools?" This British charity supports workers in some of the world's poorest countries by providing basic hand-tools and promoting local tool-making. TFSR refurbishes second-hand hand tools and sewing machines collected from British homes and sends them to community groups in Africa. It also supports the makers of tools -- Africa's blacksmiths. With tools sent from Britain they have already made well over a million items, now in daily use in their communities. The blacksmiths provide tools to artisans, including farmers, many of whom are women, and offer an accessible, cheap source of repair work. 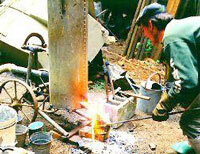 It also supports blacksmith training programs in Tanzania, Zimbabwe and Sierra Leone. ABANA -- the Artist Blacksmiths' Association of North America publishes two quarterly member magazines, The Anvil's Ring and The Hammer's Blow, with in-depth arts and blacksmithing articles, tutorials, critiques. Gallery of works of famous historical blacksmiths and ABANA members. Mailing list, list of plans, searchable supplier directory database with more than 1,000 suppliers. The Elektric Anvil has a set of searchable web forums, real-time Java-based chat room, extensive links page, site search and more. The Blacksmith's Compendium, a collection of mailing list postings gleaned primarily from ABANA's TheForge mailing list organized into single documents for each of a range of topics -- a good FAQ. Blacksmiths Virtual Junkyard -- "The idea here in Blacksmiths Virtual Junkyard is to carry on the blacksmith tradition of sharing ideas, sources and information with fellow blacksmiths." The JunkYard is an online blacksmiths' forum, with archive, the Sketchbook is for posting drawings, plans and information, Scrapbin for buy and sell listings -- anvils, forges, blacksmithing tools and equipment for sale, BigDogCatalog -- Frequently discussed subjects FAQ from the JunkYard forum: forges, anvils, power hammers, coal/fuel, iron/steel, flux, books, tools, safety, heat treating, bladesmithing, history. A good resource. Blacksmiths WorldWide is a directory of blacksmiths in dozens of countries ("Get in touch with smiths in Sri Lanka"). "anvilfire" online blacksmithing and metalworkers reference has a lot of resources. 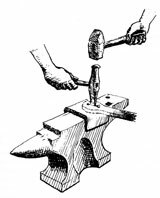 FAQs and a Guru to answer questions, "Blacksmithing in the 21st Century -- An odd mix of FAQs and Articles", planned as a book but now an online reference, a Master's Plan File -- plans, drawings and ideas from the Guru's sketchbook, video demonstrations, bookshelf, links, news, conference reports, and articles. The monthly Blacksmith's Journal features blacksmithing techniques, tools, and forged ironwork. Index of monthly designs plus Sample page showing the step-by-step, fully illustrated projects of technique and design in every issue. Large collection of high-quality original designs, with Editor/Publisher Jerry Hoffmann's clear drawings. Nine annual volumes, order by volume or by issue. Loose leaf format for easy shop use and collection of issues. Anvil Magazine, Voice of the Farrier and Blacksmith -- monthly magazine with articles about horseshoeing and blacksmithing. Useful collection of online articles, interviews and how-to's, back issues, resources and links, site search. Lytton Creek Blacksmiths -- "Simple Texas hill country blacksmiths living in the past with a T-3 netfeed." FAQs and how-to's: Basics section covers basic terminology and overview plus instructions for making a pump bellows and simple forge. Advanced section has techniques on traditional welding, cutting and splitting and more. Links, resources, books, photos. Cupolas are vertical, air-blown coke-fired cylindrical furnaces for remelting iron or bronze. They're easy to build: basically a steel cylinder lined with fire clay and provided with an air supply. Stewart Marshall of Marshall Machine Works Ltd. builds small cupolas. He says a 10-inch bore furnace costs less than US$200 to build and the blast can be provided by a large shop vac. One man can easily operate it alone. It will provide 20 to 25 lbs. of molten iron every 5 minutes and will burn for up to two hours. 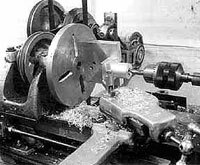 Dave Gingery's metal lathe from scrap -- 7" capacity metal cutting lathe accurate to 0.001", 12" between centres. Uses castings produced by Gingery's charcoal foundry.